The perfect Girls Night Out gift. 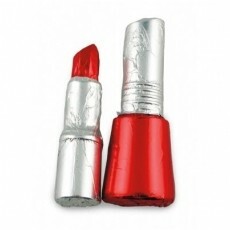 1.12oz clear cello bag filled with 1 chocolate foil wrapped nail polish and 1 chocolate foil wrapped lipstick. Mix and match foil colors for no additional charge. Tied with ribbon color of your choice. Production: 10 days Includes up to 4 color process imprint.